This magnificent Face of Christ is a detail of the 12th century ivory crucifix of Canosa di Puglia, Italy. 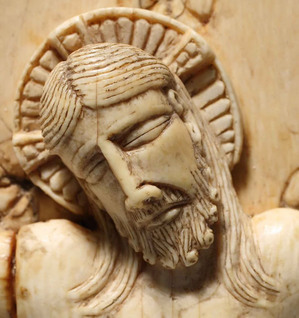 Of Byzantine origin, the crucifix is masterpiece of extraordinary beauty and theological significance. It presents the Cross, not as the gibbet, but rather as the royal throne of Love Crucified. The kingship of Christ shines through the Face marked by suffering and, yet, radiant. The eyes are closed, but the effect is one of majesty. The hair and beard are depicted with great attention. The halo bears the sign of the Cross. 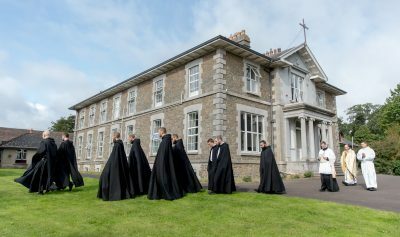 The Benedictines of Silverstream Priory have a special “vocation within a vocation” to keep watch before the Eucharistic Face of Jesus and to console His priestly Heart. Every Thursday calls us into the Cenacle where Jesus, Priest and Victim, offered Himself to the Father and consecrated His Apostles into the mystery of His own victimal priesthood. We prolong our hours of adoration of Thursday by replacing one another before the altar where the Blessed Sacrament is exposed in the monstrance. in this, the Sacrament of Thy Love. Let me adore Thee for those of Thy priests who do not adore Thee. Let me believe in Thy real presence for those whose faith has grown weak. Let me love Thee for those priests of Thine whose hearts have grown cold towards Thee in this Sacrament. And let me hope in Thee for those whose lives are dark with hopelessness. Turn upon them all, O Jesus, the light of Thy Eucharistic Face. and to grace them with the sweetness of Thy Eucharistic Friendship. close to Thy Open Heart. and for the glory of Thy Father. Amen. Father thank you again and again. This image of Our Lord does touch my heart deeply too. I will add the beautiful prayer from above to the Thursday Consecration Prayer, which I pray each Thursday before adoration. Father, I am offering my hours of adoration on Thursdays for the Cenacle of the Eucharistic Face of Jesus and I humbly ask for your approval joining you three spiritually . Do you mind adding me to your links please? Could you please translate this beautiful prayer into Italian for me? I would like to use it for our Holy Hour which we observe every Thursday from 11 to 12 PM to keep Our Lord company in His Agony in the Garden and to pray especially for priests. We are an international community of sisters (Sisters of the Holy Cross / Opus Sanctorum Angelorum)and since I belong to a house that is stationed in Rome, we use Italian as our liturgical language. Thank you!